Yokohama is a port city with a population of over 3.7 million which makes it the second largest city in Japan following Tokyo . It is located less than 30 minutes south of Tokyo and can be accessed from Tokyo International Airport (Haneda) by train or limousine bus in the same time frame. Ports in Yokohama was one of the first to be opened to foreign trade in 1859, which until then Japan maintained a policy of seclusion towards the end of the Edo Period (1603-1867). 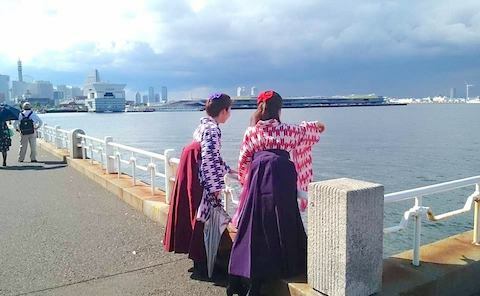 Yokohama has been actively acquiring new cultures and lifestyles from foreign countries which brought to Japan many first-time-ever things such as food, medical, sports, fashion, architecture and a wide range of cultures, which entitles Yokohama as the birthplace of Japan’s modern culture. These historical backgrounds and traditions cultivated long ago has been incorporated into the present fashionable and sophisticated streetscape. The mix of historical essence, the new and advanced cityscape, and the harbor environment makes Yokohama very unique which is why it has been attracting many domestic and foreign tourists until today. You can still feel the historical traditions and experience things today and enjoy the latest tourism spots at the same time. There will always be something for you to enjoy and appreciate in Yokohama. HAVE FUN!! Whether you are into cosplay or just like to try out some costumes why not try "Haikara-walk"? You can have your hair styled at the salon and dress up in a nice kimono. You are all set to time travel to the 19th century when Japan started to open its door to Western culture. There are so many places to visit in Yokohama – Chinatown, Yamashita park, Red Brick Warehouse, Foreign General Cemetery, Ijin-kan, and more! Walking around with your partner or friends wearing a modern kimono or hakama, with a feel of Haikara-san? They also offer Bankara style of hakama for men. For details and reservations visit their official site. This word came from “high collar” which was a fashion imported from Western countries to Japan in Meiji period. People who adopted the new fashion became a trend and were called “Haikara-san”. This word was created in contrast to Haikara, referring to people in rustic fashion. If you unfortunately encounter some kind of natural disaster while you're traveling in Japan and need to learn about what is going on, below app may help you. This Application notifies a user with EEW, Tsunami Warnings, Volcanic Warnings, Weather Warnings, Heat illness Warnings and Civil Protection Information issued in Japan. It's a free application developed under the supervision of Japan Tourism Agency. It also provides various functions useful for foreign tourists in Japan. It is available in five languages: English, simplified and traditional Chinese, Korean, and Japanese.